A fade pointer element is a type of control element that will fire a selected fade in an audio element. Target mode is how you tell a fade pointer element (FPE) to point at a fade within any audio element. There are multiple ways to enter target mode. You can hit the Target button on an empty FPE or in a FPE's options menu, or you can hit ⌘+T. If no FPE is selected, click on the fade pointer element you would like to place a pointer to the target. Move your mouse into the element you would like to target, and a pop-up menu of the fades within that element will appear. Exit target mode by clicking anywhere on the canvas, hitting the X button in the top left corner, or typing ⌘+T. A FPE can point to multiple fades. A FPE will fire all these fades when triggered. To add multiple fades, select all the fades you would like to be in the FPE in target mode. Restoring the level of an audio element back to the original level is easy. There is a special type of fade called a restore fade, which returns the level of the element back to it's original set level. If you modify the element's levels, that restore fade will update to the new levels. A restore fade cannot modify levels. Users can only modify duration and title. Fades live in the audio element, but you can modify the fades within the fade pointer element, as well. Be aware that by modifying the fade in the FPE, you will be modifying the fade within the element itself. If you have multiple FPE's targeting that same fade, it will modify the fade in all FPE. In a fade, the fade knobs will show 3 different levels. 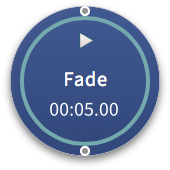 On an audio element or playlist element, you can have it stop the element when the fade completes. For example, imagine you have a fade out, and when it is fully faded out, you would like for the audio to stop playing. (This is helpful in preserving CPU). Checking the autostop button will automatically do this for you.